Gunnar Barnwell races in the super-G at Mammoth on Feb. 26. The USSA Wild West Series Junior Championships Qualifier took place on Fascination at Mammoth Mountain on Feb. 26. The USSA U-16 Junior Championships is a championship event for racers ages 14 and 15 years old only, from the five divisions of the Western Region. 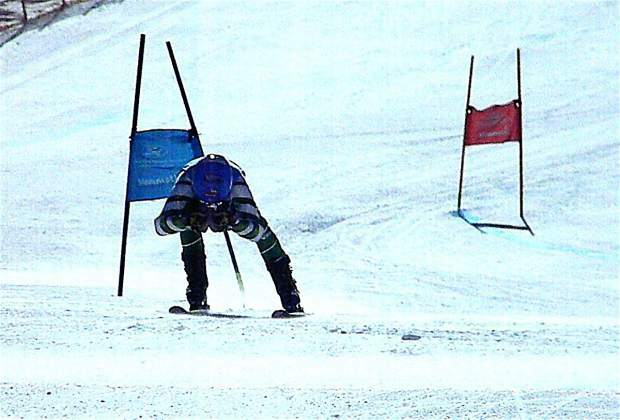 The event consists of super-G, giant slalom, slalom races and skills quest competition. The quota is filled using “World Cup Points” (WCP) scored in the U-16 Junior Championships qualifying events (WILD WEST SERIES). There are three weekends contesting SL, GS and SG. Each competitor’s top five WCP scores from the nine qualifying races count, regardless of discipline. In the event of a tie, the athlete’s best result using WCPs is used even if that was previously applied in their original qualifying score. Selection includes two woman racers — Julia Holm with 306 WC points taking two fifth-place finishes and just missing the podium with a fourth place, putting her 10th overall in the series; and Julia Capaldi with 80 WC points taking 17th, 16th and eighth, placing her 26th overall in the series. The young men were led by Mathew Smallhouse with an outstanding 511 WC points — first overall in the series placing second, third and fifth, followed by Zephyr Cove’s Gunnar Barnwell with an amazing first-place finish in the second race, scoring a much needed 100 WC points, putting him seventh place overall in the series while picking up two sixth-place finishes as well. “The improved overall standings are the result of adding a deep pool of FIS and former NTG coaching staff this season,” said Alpine Program Director Raquel Norton. Not only have we put four young men into the championships, including Mark Allen with 91 WC Points — which is an outstanding number for a first-year U-16, ranking him 25th overall and three consistent top 25 finishes over the weekend. Rounding out the team is Kobe Robinson with 90 WC points and finishing 27th in the series. The real shocker was at the U-19 and senior level of the race. The youngsters in this series were competing against individuals who have already in some cases been selected for the U.S. Development Ski Team, the National Training Group, or they are members of the Far West Elite team. Diamond Peak has the most elite of those racers with Jordan Cashman leading the squad dominating and winning all three races in most cases by several seconds. “At the qualifying level, it is really about seeing how close the younger racers can get to the accomplished more experienced racers,” said head Alpine Coach Konrad Rickenbach. Calvin Wilson and Peyton Norton also round out this incredible pool of talent, which found Calvin on the podium for all three races while Norton was edged off one day and had two top-10 finishes in the other two races. Also finishing in great shape with two top-10 finishes was Incline Village’s Winston Pretti and Noah Cleary. Far West Champions pick up the coveted jacket and leave for Big Sky on March 12. Who knows? This jacket might lead to one of those coveted US Ski Team jackets one day!